It’s officially less than 2 months until Christmas – have you started shopping yet? Every year, Step2 adds a number of fresh and exciting toys to their award-winning lineup and this year’s new additions do NOT disappoint! Today I’m excited to tell you about 2 of their newest toys & give you the chance to win them too: the All Around Easel and the My First Advent Calendar! Unleash the creative genius in your kids with the sturdy, two-sided easel for two! 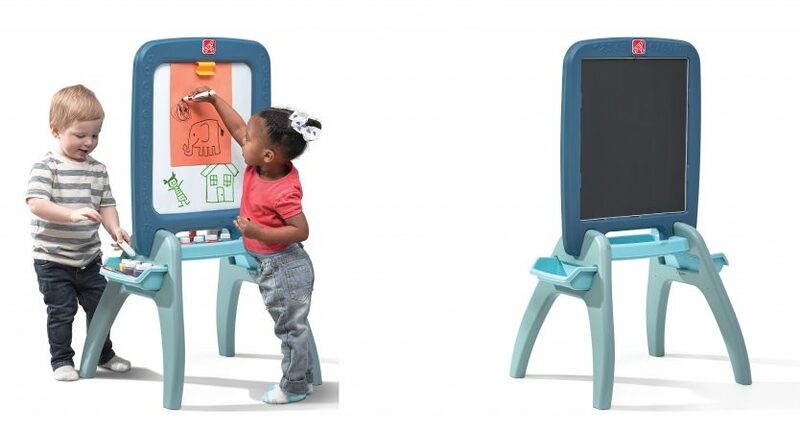 Together, mini Picassos can now draw and write to their heart’s content on a variety of backgrounds, including a chalkboard on one side and a magnetized dry erase board on the other, which also features a clip to hold paper in place. As any true artist will appreciate, all art supplies (not included) can be kept right within a short arm’s reach either in the spacious center tray or in the two outer storage bins that remove for easy clean-up. Art has never been more fun! The All Around Easel itself is not necessarily new to the Step2 lineup of toys, but it was just released in an exclusive color combo available only at Costco (both online and in stores). Don’t you just love the shades of blue in this easel?! And, as you’d expect at Costco, the value on the All Around Easel cannot be beaten! It is priced at just $29.99 and is available both online and in store. 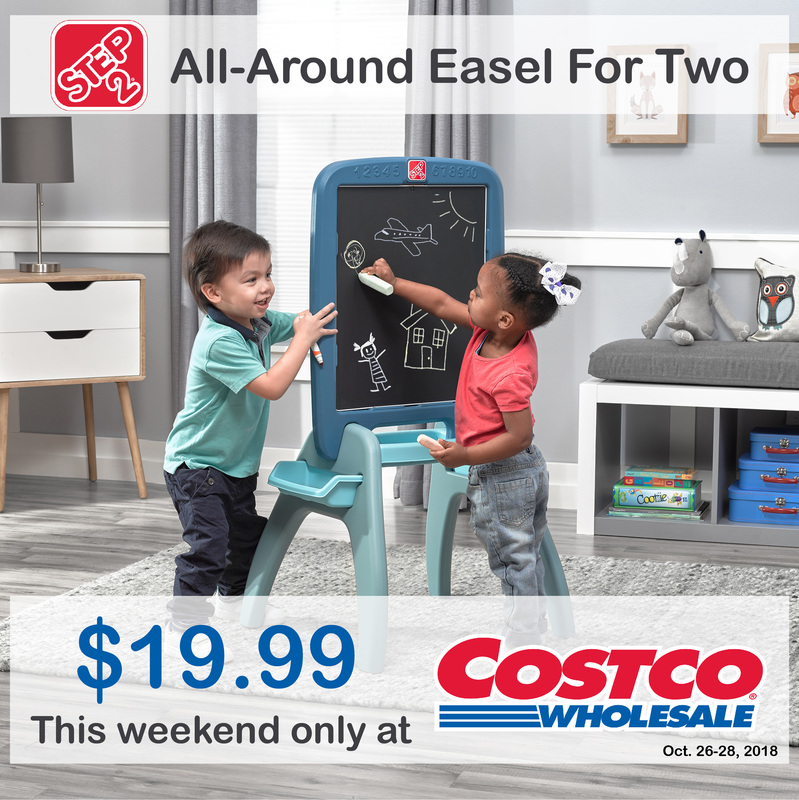 This weekend only (October 26-28) the All Around Easel will be on sale at Costco and at Costco.com for just $19.99! It’s the perfect time to get a jumpstart on your holiday shopping! And then there’s the brand new Step2 My First Advent Calendar. This calendar is just absolutely darling and perfect to use year after year! The Step2 My First Advent Calendar was just released and is an Amazon exclusive. Get yours now so you’ll be ready to start on December 1st! 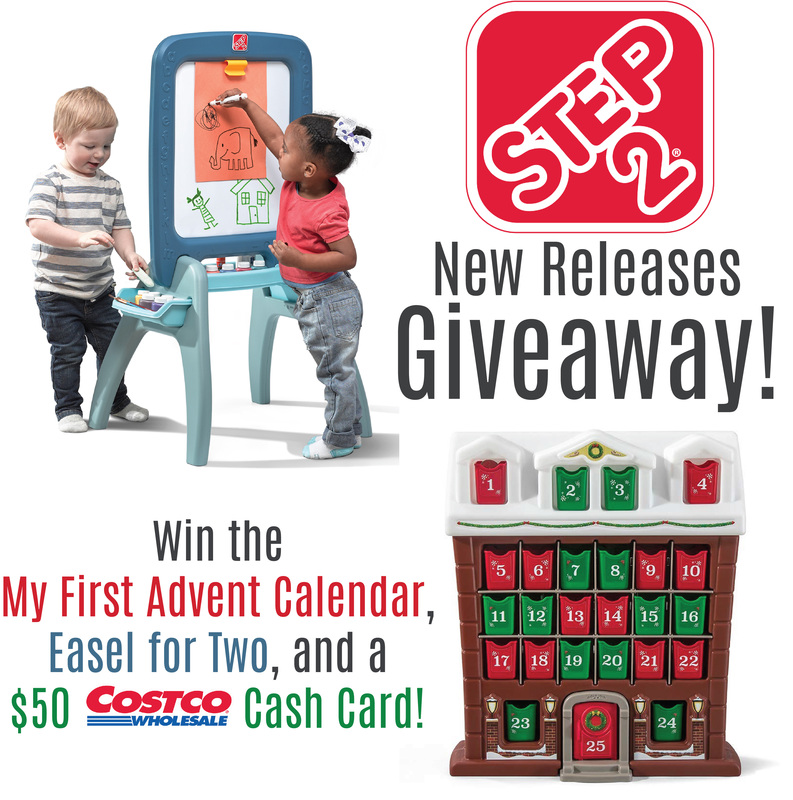 I’ve teamed up with a few other great bloggers to give one lucky person a prize package containing the Costco-exclusive Step2 All Around Easel, the Step2 My First Advent Calendar, plus a $50 Costco Cash Card. Don’t have a Costco membership, don’t worry – you can use the cash card without a membership AND you can shop online with it! If you’d like a chance to win, just enter using the Giveaway Tools entry form below. This giveaway will end on November 9th at 11:59pm EST. It is open to the lower 48 US states. Good luck! Disclosure: Thrifty Nifty Mommy and the participating bloggers are not responsible for prize fulfillment. Images and item description are courtesy of Step2.